A PDF subject can tell readers what the PDF file is about. When you need to set PDF subject and convert EMF to PDF, you can use the command line version of VeryPDF HTML Converter to solve the problem. Via command line, you can easily and quickly take four steps to set PDF subject and convert EMF to PDF. This article will show you how to do it. To download the command line application by clicking VeryPDF HTML Converter Command Line. To buy it, please click Purchase. Then please take several seconds to install VeryPDF HTML Converter Command Line in your computer. The command line should consist of four elements in order: the directory of the executable file, the command, the directory of the input file and the directory of the output file. 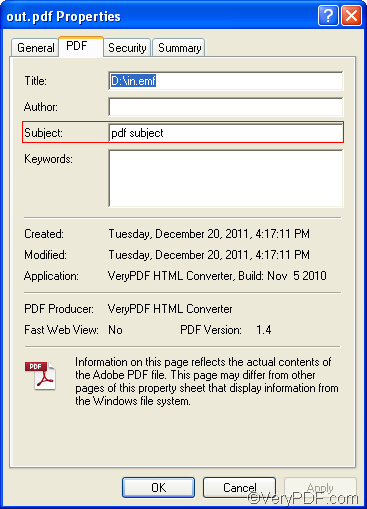 The command that can be used to set PDF subject is -subject <string>. The angle brackets often enclose essential contents. string refers to character string, which should be marked by quotation marks “” when appears in a command line. For example, the following command line can be used to set “pdf subject” as the PDF subject and convert EMF to PDF. You can substitute the directories in your computer for the directories in the example. You can also change the character string following the command with whatever you like to be the content of the PDF subject. D:\htmltools\htmltools.exe ----represents the executable file in the folder called htmltools on disk D.
-subject "pdf subject" ---- the command that can be used to set "pdf subject" (without quotation marks) as the PDF subject. D:\in.emf ---- represents the EMF file named in on disk D.
C:\out.pdf ---- represents the PDF file named out on disk C. The file extension of the input file and output file can tell the computer to convert EMF to PDF. The moment you press the “Enter” key, the computer prompts to convert EMF to PDF right off. Meanwhile, you can view the conversion status information in the command prompt window. Once “result =OK” is displayed in the command prompt window, you can check the PDF subject in the “Properties” dialog box of the PDF file as illustrated below. How to rotate the page while converting emf to tiff? How to convert url to pcx in a command line? This entry was posted in HTML Converter (htmltools) and tagged command line, emf to pdf, set pdf subject. Bookmark the permalink.